Returned to this once abandoned piece during some downtime at work. I think I just felt like messing around with a particular palette. I knew you might do this if I told you about my power. I saw this, and I told you, anyway. I took a risk at your expense. …There was a chance you’d understand this, and we’d be closer. 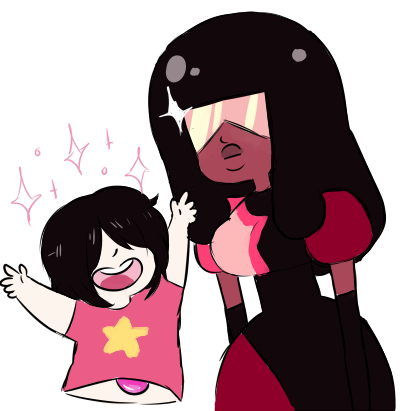 Garnet is a babe and no one can convince me otherwise. Bit of a sketch dump of Garnet in Estelle’s(her voice actress) outfits! Am I the only one who’s terrified by that? Not really, dear anon. Personaly I think it's cool that they make Garnet a triclops with an unnatural third eye, but I've seen people being freaked out about it in the Steven Universe wiki, and some people saying that the third eye just makes her more awesome. And then there are people who say what's underneath her shades should be kept a secret until future seasons.